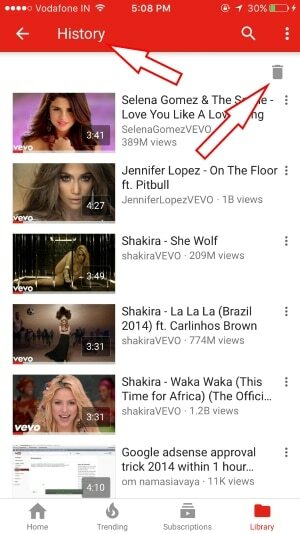 Unable to find a recently played video on YouTube iOS app, very functional YouTube app we can do all the stuff like Find Recently played YouTube video, Add or Create a new Playlist, Clear YouTube Search history on iPhone/ iPad, Filter video in the Search result. Also know how we can see also on other devices like Android, Mac, Windows PC Browser (we must log in YouTube account with common Email and Password on other devices). Search history videos saved in the queue in a single account, not saved on Device specific. So most recent videos are easy to find then before few days or months. If you are using your YouTube account on multiple devices or regularly, it will be in search history in the list. YouTube saved search history in the cloud. Once you cleared it, it will be erased on all devices. After that, there is a no option for restore. Step #1. 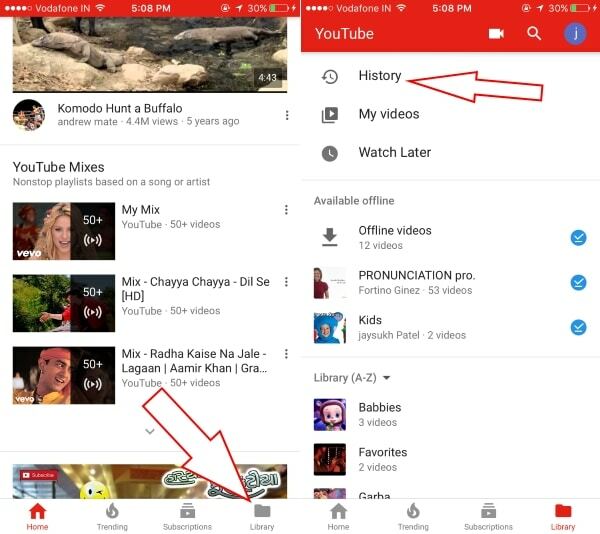 Open the YouTube app on your iPhone/ iPad. Step #2. Tap on Library from the bottom right corner of the iOS app screen. At Top, the First option is History. Enjoy your recently played video. To clear Watch History tap on Delete icon from the top. You have been seen YouTube video on iPhone/iPad, wants to access on a desktop browser. Click on Direct link; See the All played video for your account. A note has an iOS app. Yes, we can try on iOS Browser, after login YouTube. You are searching every time your favorite recently played video in app history, a Better solution is Save Video offline or Add-in YouTube video in Playlist. Thank you for being with us, get more YouTube hidden tips and updates after recently played YouTube video from us via our social page, just like or share it from below buttons.